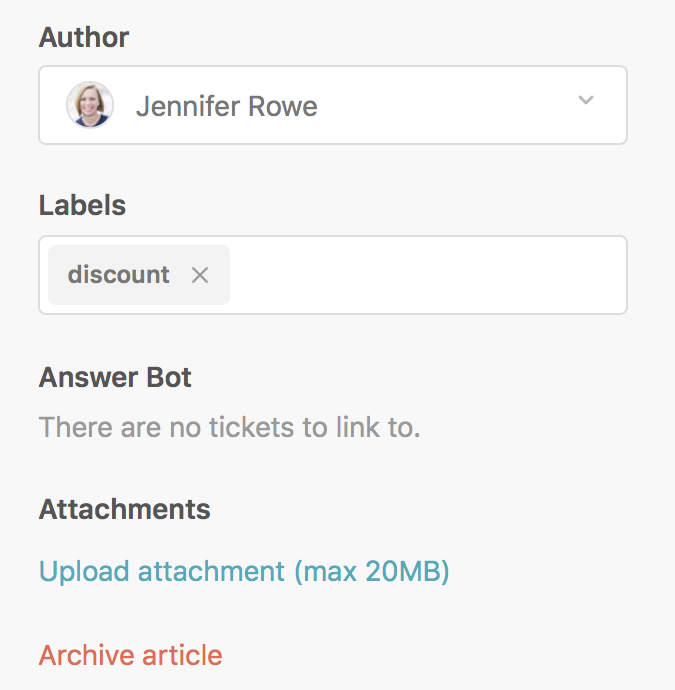 You can archive articles to remove them from your knowledge base. Archived articles are moved to the archived articles list. You can permanently delete articles after they have archived. If you need to archive multiple articles at once, see Updating knowledge base articles in bulk. Archived articles are available to Guide Managers only. They view and restore articles as needed. Navigate to the article you want to archive, then click Edit article in the top menu bar. You might have to scroll down to see this option. The article is removed from your knowledge base, along with any translations associated with the article. Guide Managers can restore or permanently delete archived articles from the archived articles list. If you need to delete a translated article see, Deleting a translated article. Link "Deleting a translated article" is broken. Please help to understand how to delete archived article. Thanks for letting us know. The link is fixed now! Not deleting articles completely is absolutely unacceptable. A lot of articles, particularly in the beginning, are created to test things out. A sandbox is only available on the Enterprise plan but not in the Professional plan, and the support is refusing to help. There has to be a way to get this done?! When on the edit article screen there is not a drop down for edit article. I did find a "Delete article" option that is in the lower right hand corner. Yep, you are correct, "edit article" is a button and not a drop-down. The only drop-down menu indicated above is for "Add." The screen shot in the article is of the lower right-hand corner, so yes, the "delete article" option is in the lower right hand corner. Hello - I have 51 articles in my Deleted Articles section - they have been reviewed and no longer apply so I would like to purge them. Is there no way to purge deleted or must I delete 1 at a time from deleted? I don't see "Delete Article" option on the edit article page, neither the "Deleted Articles" section. Is there any setting needed? My orgnization has quite a few articles we need to DELETE instead of ARCHIVE. Deleting an article is a two-step process. First you'll need to archive it. Once that's gone, go into your Archived articles list in the Guide admin dashboard and click on that article. Once you're in it, you'll see the option to either restore it or delete it. The delete option will be in red at the bottom of the right-hand column.